I went to the free swap at the library, bringing my bags full of old junk and expecting some other, fresher and thus more fun junk in return. I did not expect a Pfaff sewing machine to be sitting on the table. Pfaff and I have a history. 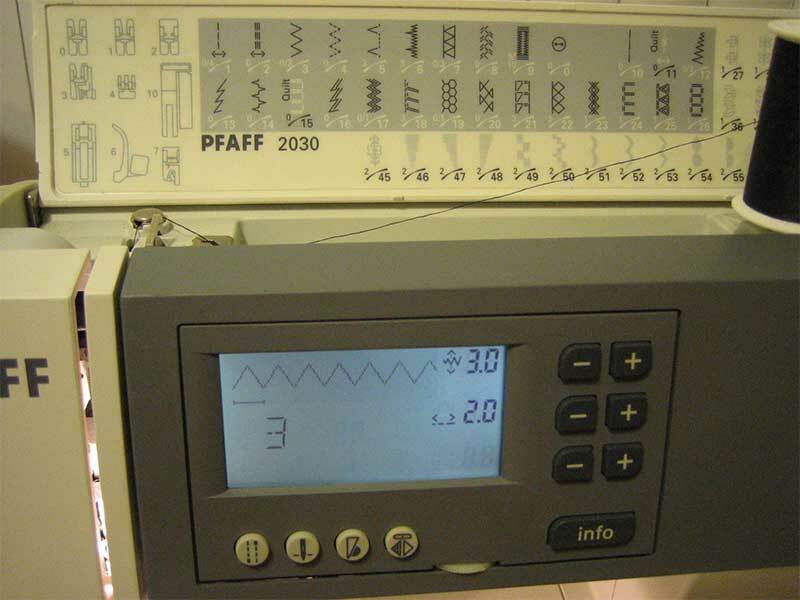 Long ago I was in a sewing machine shop and there was a Pfaff from the sixties with no tag on it. The employee looked around for a price sticker, then fetched the "Blue Book of Sewing Machines" which she said the owner used to determine prices, and it was $150. I didn't buy it, since $150 was all I had and I needed other things. I went home and looked at the internet, and found out it was one of those classic, wonderful machines everybody wants. It had lots of built-in stitches, all the accessories, most importantly it had a "dual feed" system so it pulls the fabric from both top and bottom-- no more fabric scooting and having to be carefully held both before and behind while feeding it through. Then I wanted it very badly, but going back was pointless: the owner was shocked that the employee would have sold me that for $150, and refused to do it, because she said she could get $500 for that easily. So I commenced kicking myself about it. Why didn't I grab it while I had the chance? 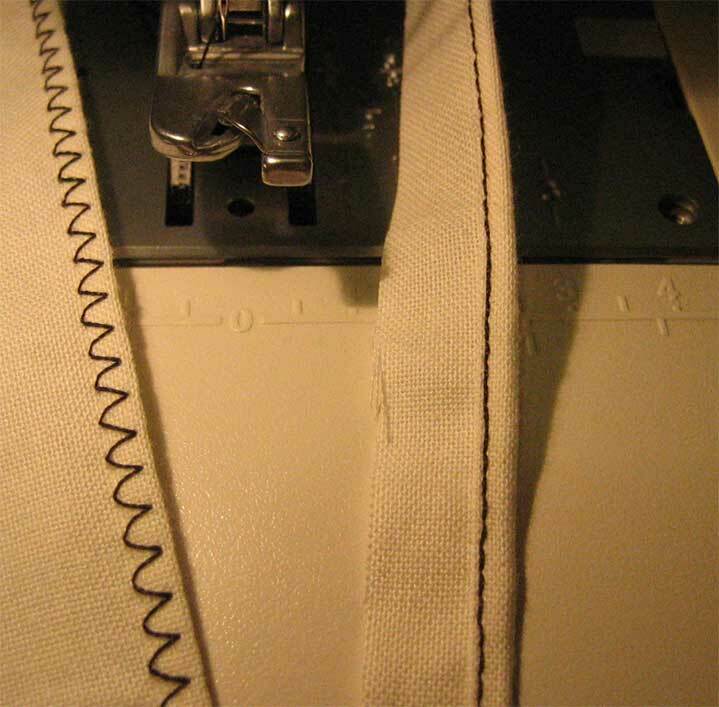 Every time my sewing machine made a mess of things, I'd think of that Pfaff, and it would even come to me randomly sometimes, not merely as a missed bargain, but a sign of my overall ineptitude and failure to be on the ball. Just a few months ago when it occurred to me at night, it also occurred to me to look at it from the other side. If I had plunked $150 and walked away with that machine, what would have happened to that employee? She was obviously new and eager. Losing the owner $350 might not have made a good impression. Would I want a bargain for myself at the expense of trouble for somebody else? Maybe that lady's thankful for her lucky escape. So with that in mind it was easier to forget about, and continue to make do with my old machine that I had ripped some of the springs out of and put rubber bands on instead. Me and that old Mexican Singer had come to know each other well after a while. But you see why that word PFAFF attracted my attention clear across the room and lit up a whole array of blinking lights on my little brain, and I was over there in a heartbeat with my hands on it. I asked the people who had brought it if it worked. The lady said she couldn't get it to work, but she didn't know if there was anything wrong with it. It had a manual with it that she couldn't figure out. Her husband said maybe it just needed some oil. I said I was just the type to tear sewing machines apart, and out it went out to my car, locked the doors on it and then went back in to resume swapping my old junk for other people's. Such fun that is! It's fun to pick up cool stuff all for FREE and just as much fun to see my old junk headed away in other people's arms and they are obviously happy about it. It's a totally non-capitalist sharing of the love. There was fabric too, including two pieces of flannel each large enough for a child nightgown and three yards of fashion camo that would make a good man's shirt. I picked up a set of thick flannel sheets with faded Yu-Gi-Oh characters on them, maybe I could use them for quilt batting? I took the Pfaff home and started looking at it. It had everything, the cover, manual, and cords. The plastic hardshell cover was nothing less than a work of brilliance. 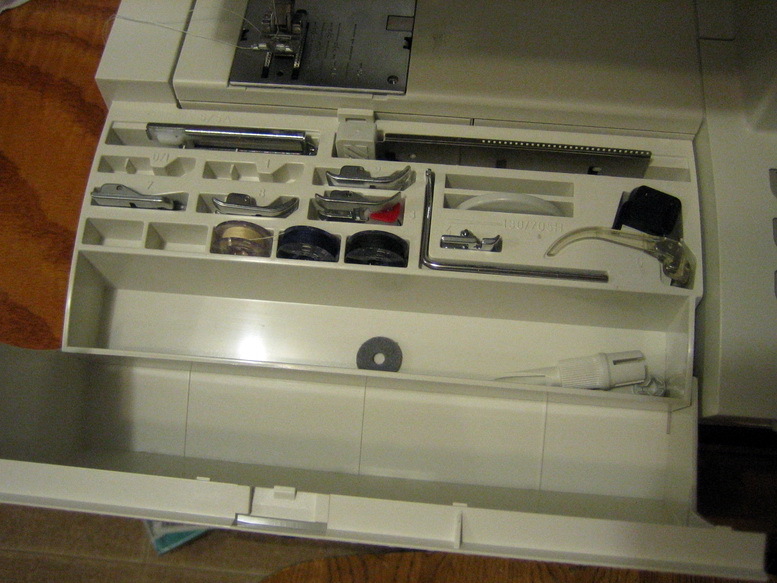 It drops over the sewing machine and the machine's handle flips up through the case for carrying. No more carrying it gingerly, afraid the machine will fall out the bottom! The case has a deep slot in the top for the manual and the cords. So you put the case over the machine then roll up the cords and drop them in there, and flip up the handle. When you set the case aside, the manual stays in it. The free arm was another extremely well-designed little dilly that swings out of the way, or removes completely by just lifting it up from a steel peg. The front of the bed flips up to reveal all the accessories in an organizer. The accessories are all there! Wonderful so far. But does it work? Moment of truth. I plugged it in, pushed the pedal, and nothing happened. The motor turned on, but the needle didn't move. So there was some life to it, but the answer to the big question was NO. I was seriously bummed, as I had already started getting my hopes up. I started fiddling. Talk about cryptic! We've got an instrument panel here with buttons with numbers and shapes, and they do WHAT? Pushing buttons made the display change apparently randomly. I couldn't discover a pattern to it. I looked into the manual: likewise cryptic. Where to start? It was all in genuine English by a native English speaker who I don't think has ever run a sewing machine. I don't blame that lady for saying she couldn't figure it out, I couldn't either, not even after half an hour's serious study. 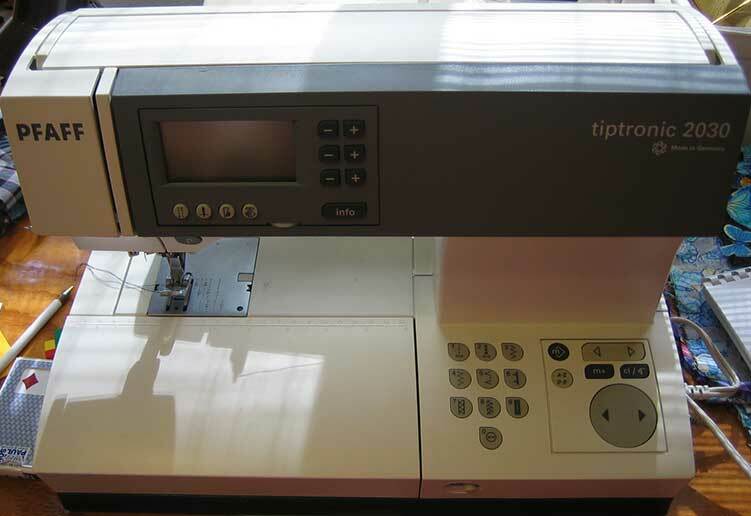 It even tells me "The manual is as easy to figure out as the sewing machine is!" Well, that's the truth! I found the troubleshooting section, which said for lack of sewing a possible cause was "thread stuck in the hook ways". In the what? I don't know what a hook ways is. It's not in the index or on the exploded diagram with labels. I cleaned a big fat thread out of the part where the bobbin goes, and after that it seemed to not-sew a little better. The manual told me there was no servicing to be done. It requires no oil and no cleaning. It's totally self-contained. 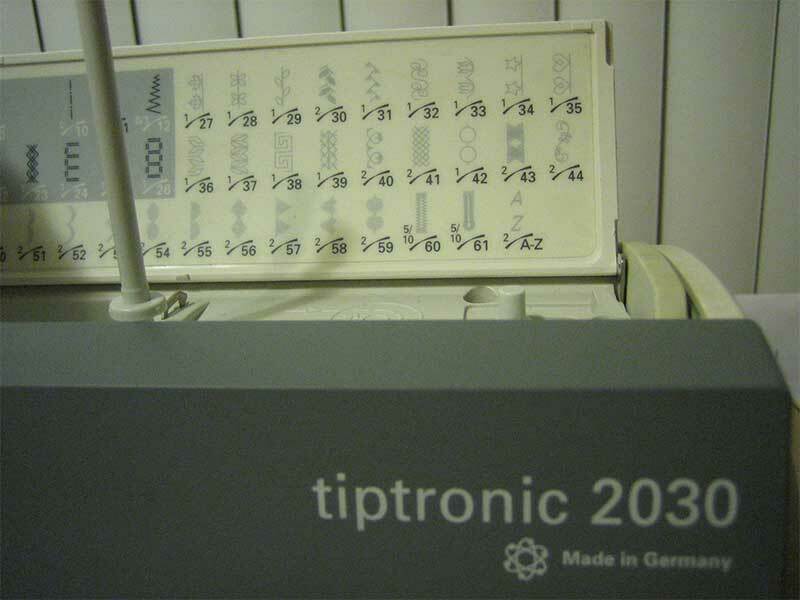 The German engineers have produced a finished work of perfection not to be messed with by the dummkopfs like me. That's encouraging and yet not. It was when I happened to pushed the pedal while the top was flipped open that I noticed the bobbin winder spinning round and round. Ha! Yes, that was the problem! 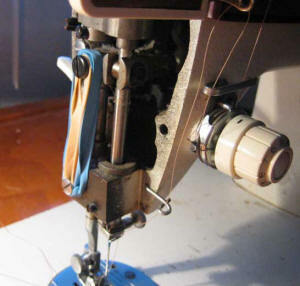 It was winding an invisible bobbin all this time, and the needle doesn't move while it's winding a bobbin. 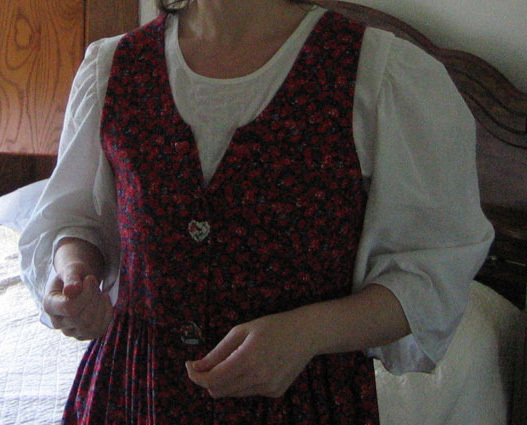 It really didn't need oil or deep study: just release the bobbin winder, and away it goes, sewing flowers and maple leaves and cross-stitch and your name in a series, like @."§".,¸¸,.·´¯`·. "§@ JANEL @§".·´¯`·.,¸¸,. "§"@ over and over, and has memory slots to store patterns for later. Cooool! It was made in 1999, sold for $1200 new and still goes for $600 on ebay. Went to internet again and heard ladies talking about theirs and how all-around wonderful they are. They commented that you never see these for sale used, because everyone who gets one keeps it for the rest of her life. And I have one! I'm still just floored that that was me in that place at that time. This is an entirely different class of Pfaff than the one I missed! It's an entirely different class of price tag too, costing exactly nothing, "and he addeth no sorrow with it." See, God's gifts are better than the ones we "could have, should have" gotten for ourselves! The dual feed is the absolute greatest. It sews light, slippery fabrics with no scooting or stretching. The narrow hemmer's subtly different from any I've seen before. 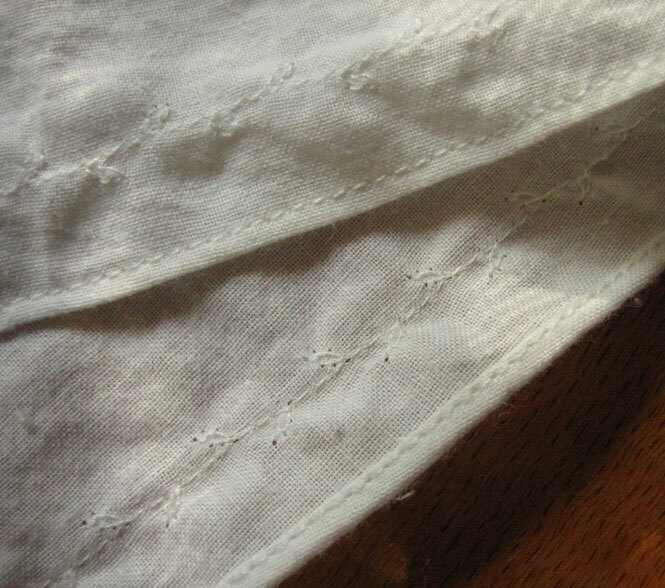 And radically different in that I got it to WORK RIGHT and make a beautiful narrow hem, the first try and every try after that. 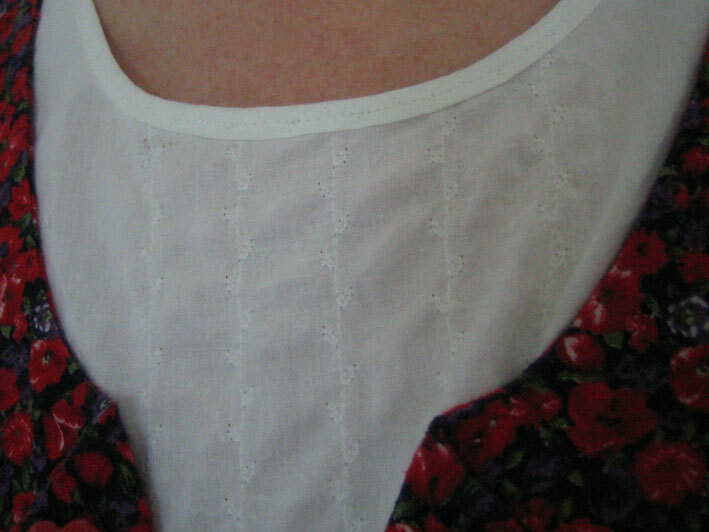 And here's a white top I just made with it. Mostly done. The sleeves will get elastic. 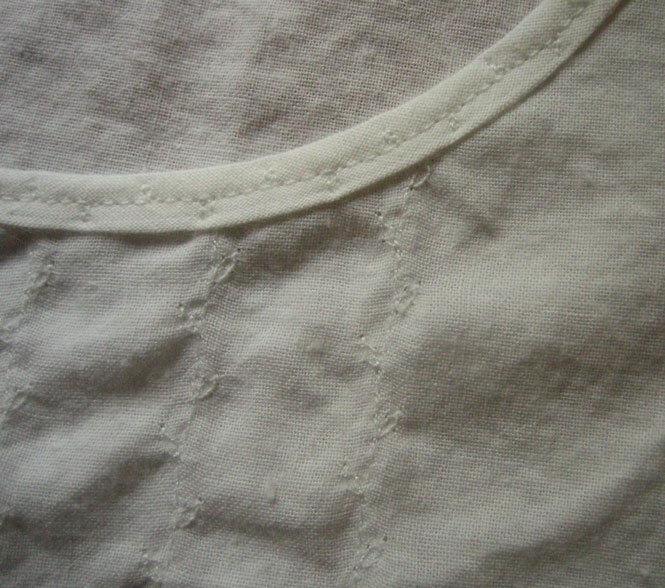 There's the leaf stitch, #29, on the front and around the sleeves, and over the self binding to make it look a bit more planned, and the narrow hemmer on the sleeve edges. It looks less homemade than usual. But I have a lovely treadle, too!